This website (https://www.covermore.com) is comprised of information, data, graphic, sounds and images (“Content”) and is owned and operated by Cover-More Inc., a Delaware corporation (“Cover-More”). 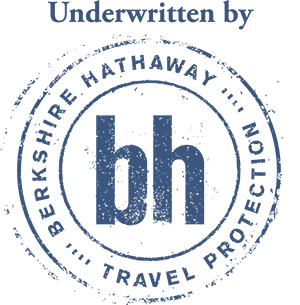 Insurance Products described on this website are offered by Berkshire Hathaway Specialty Insurance Company (formerly known as Stonewall Insurance Company). The Content on the Website is intended for use by US citizens and permanent residents seeking travel insurance for travel domestically and internationally from the United States. Unless otherwise expressly set forth herein, Cover-More makes no representation that materials on this website are appropriate or available for use in any location. Those who choose to access this website do so on their own initiative and are responsible for compliance with local laws. Except as expressly set forth herein the information contained on this website is not an offer to sell or a solicitation to buy any security, insurance product or other product or service by Cover-More. No security, insurance product or other product or service is offered or will be sold by Cover-More or, if sold by Cover-More, will be effective in any jurisdiction in which such offer or solicitation, purchase or sale would be unlawful under the securities, insurance or other laws of such jurisdiction. Some products and services may not be available in all jurisdictions. The Content on the Website is not intended to be a complete description of all terms, exclusions and conditions applicable to Cover-More’s products and services. The Content and the Website itself does not constitute an offer or an intention to enter into a legally binding contract with any user, except where a user obtains a quote, answers the questions relating to the insurance, agrees to the terms of a specific insurance policy and purchases the policy online. This feature is only available using the quoting engine and the insurance coverage commences on the date and at the time shown in the written confirmation supplied by Cover-More to the user. Except where specified, the Content does not form part of the terms and conditions of an insurance policy, the protection plan or any subsequent insurance contract which is entered into by a user. The currency of transactions on this Site is in United States Dollars (USD) only. Method of delivery - After receiving payment you will be emailed a Certificate of Insurance. For a hard copy of your insurance certificate, please contact us on 844-411-2487. The policy will be valid for the period you have chosen as stated on the Certificate of Insurance. You understand that clicking the agreement box before checkout constitutes an electronic signature. The electronic signature evidences your consent to all of the provided terms and conditions. Electronic signatures are legal and enforceable in the same fashion as a traditional signature. You consent to the issue of the policy documents, and all other notices, electronically via email if an email address is provided. You should be diligent in updating your provided email address if any changes occur. You may withdraw your consent and request a paper copy of their policy documents via email [email protected] or over the phone at 844-411-2487.